It's been suggested that our history of Taste Tests skews a tad bacon-centric here at The A.V. Club. But here's the thing: Y'all are the ones who keep telling us to eat/drink this stuff, even going so far as to send the product directly to us. You're the enablers; we're just bobbing along on the zeitgeist here. That said, today's entry into the canon of baconized comestibles took a little doing on our—well, my—part. As far as we can tell, no one (shockingly) has mass-produced and marketed a bacon-flavored vodka. But several of you alerted us to this random food-blog entry detailing how to make the stuff, and since then, we've heard tell of it showing up at the odd bar or restaurant as part of a fancy-schmancy cocktail, usually of the Bloody Mary variety. Apparently, my wildly successful take on Nutriloaf qualified me to prepare this delicacy to delight/poison my coworkers, so off I went to purchase a package of bacon and a bottle of mid-shelf vodka. There isn't much to making bacon vodka: You throw a few cooked slices into the bottle, put it in a cupboard, and wait three weeks. The toughest part was separating the infused vodka from the globules of fat that congealed and floated to the top. I tried a couple of passes through cheesecloth, but was still left with visible white chunks. Since bacon vodka is a hard enough sell already without fatty backwash floating in it, I gave it a couple more passes through a pair of (new) nylons, and that seemed to do the trick, leaving me with a mostly clear liquid the pale yellow color of healthy, bacon-scented urine. Taste: With one exception, the reaction to straight bacon vodka was surprisingly neutral. Most tasters agreed that it was nowhere near as horrible as we expected, though Tasha spit it out and ran away in horror. [Hey, I walked briskly in disgust. —ed.] It's basically salty vodka, with a slightly smoky quality that's not entirely unpleasant if you're a fan of savory drinks. (It should be noted that we drank this at room temperature, as we weren't sure if refrigerating the stuff would cause the remaining atoms of fat to re-congeal. 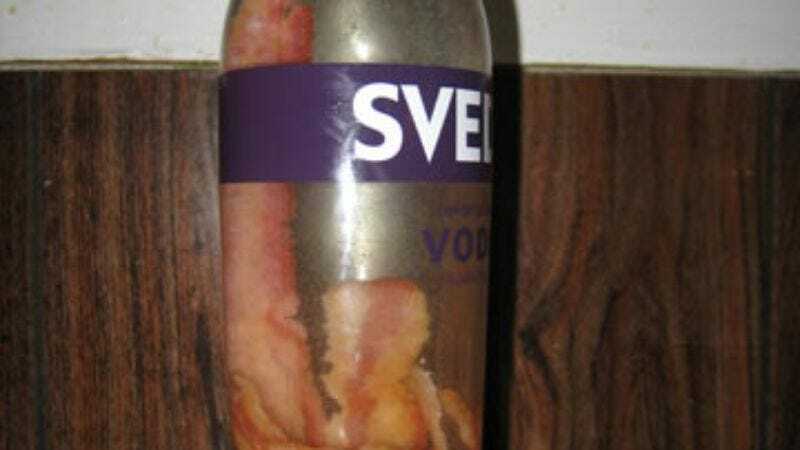 Perhaps we're missing out on the glories of ice-cold bacon vodka.) The BLTini (one part V8, one part vodka, with a Bacon Salt rim) was a definite hit among those who tried it, though many opted out due to an aversion to tomato juice. Once again, for fans of savory drinks only. One brave/reckless tester added some to her Diet Coke in spite of general revulsion at the suggestion, to underwhelming ends. The citrus-bacon combo was surprisingly non-offensive: Were it served cold, maybe with some Triple Sec or other complementary liqueur, it could probably be a serviceable, if not wildly popular, specialty martini at some fancy fusion joint. The bacon-vodka tonic tasted, well, like a vodka tonic, with a pretty unpleasant aftertaste. There's really no need to dirty up such a clean-tasting cocktail with the brackish essence of salty meat. Then again, there's really no need to muddy up such a clean-tasting liquor either, outside of novelty appeal—which it certainly has: This was our most well-attended Taste Test ever. — "Ew, why is it yellow?" "Really? Your problem is with the color?" — "It smells like fat." — "It's got that nose of rubbing alcohol." — "It's just kind of salty with a strong aftertaste." — "It tastes like seawater." — "I can feel my heart being pickled." — "Agh, I can still taste the bacon!" — "I've had grosser versions of flavored vodka." — [Does a spit take.] "Oh God, that's the worst thing ever. Seriously, ever." — "It tastes like rubbing-alcohol fumes and rancid bacon fat. Like licking a piece of bacon that's been hidden behind a cabinet in a hospital for a month. You are a cruel, cruel woman." — "It tastes like I'm having a stroke." — "The bacon really masks the taste of the vodka. Now there needs to be something to mask the bacon taste. Maybe more vodka!" — "I definitely taste meat, but just as an aftertaste. It's obvious my vodka has been tampered with, but it's hard to tell if it's bacon or a steak that's been sitting under my refrigerator for a month." — "Make a bacon screwdriver out of this, and you're halfway to a balanced breakfast. Now all you need are some domestically abused eggs and suicidal waffles." — "My mouth is all salty. I think it's leaking up to my brain now." — "First bacon-vodka burp: more vodka, less bacon." — "From this point on, the consumption of either vodka and bacon will be forever tainted by this experience. Thanks a lot, Genevieve." — [About the BLTini.] "It's like a new Campbell's soup line." — [Bacon vodka and orange-pineapple juice.] "I have no reaction for this. I don't even know what to say about this." — [Bacon vodka and tonic.] "It smells and looks and feels like a vodka tonic, so your body goes, 'Oh it's a vodka tonic.' Then it hits your stomach and your body's like, 'Oh, it's bacon, maybe I should go throw up.'" — [Afterwards.] "It smells like a men's locker room in here." Where to get it: Make your own damn bacon vodka!